delivers quality service at great savings to more than 220 countries. With our smart booking technology it's easy to save up to 60% on UK next day delivery or courier services around the world. Compare parcel prices from the best couriers. Our courier comparison service enables you to directly compare the prices from the best couriers, and make cost savings of up to 60% even when compared with postage services. But we offer far more than just low prices, we also offer a huge range of services and amazing customer care. And with over 30 years' experience, with you can compare delivery quotes with confidence. 3 – 7 day worldwide Delivery. 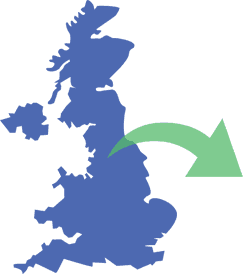 We pick-up from your door, and offer same day collection from most locations across the UK. Collections are made up to 7pm, and we also provide a drop off service, if you would prefer to not wait in for the courier. We deliver between 9am and 7pm on working weekdays and most couriers make 3 delivery attempts as standard. We always quote the estimated delivery date when you get a quote, and you can upgrade to our ‘guaranteed delivery' if you want to a money back assurance. Most couriers obtain a signature for every delivery, but if you need to be sure, you can purchase our ‘signature required' upgrade. Whether you're sending a large parcel, or a pallet, by road or air freight, is a specialist in large parcel delivery. We can ship items up to 1,000 kg in weight, and 270 cm in length. However, is not a removal service, and we cannot ship furniture unless they are palletised and professionally packaged. Our economy delivery services offer excellent value, when shipping air freight or large palletised items. Simply compare prices from the best freight providers, and select the best quote for your needs. At every point in a parcel's lifecycle it gets a scan. The scan states where the package is, and whether there are any issues that could cause a delay. provides real time parcel tracking on every shipment. So you can keep an eye on where your package is, from the moment it leaves your doorstep. Not only that, if a delay occurs, we'll automatically notify you and the recipient by email with tracking updates and let you know if we need your help to resolve anything. We call it 360 tracking, and it means with , you always know where you stand. With so many parcel companies to choose from, it's difficult to know who to trust. With over 30 years' experience, we're one of the UK's highest rated online couriers. doesn't just offer cheap postage; we also offer amazing service. Whether you're a private individual, an eBay shipper, or an SME sending air mail, a small postal package, or a pallet by , offers cheap parcel prices without any compromise on quality. offers UK parcel delivery and international courier services to over 220 countries. And we have a 30-year track record of delivering. And because we're part of the group of companies, we're able to offer outstanding delivery rates. However, at we do far more than just deliver. We're passionate about logistics, and we believe in delivering more. 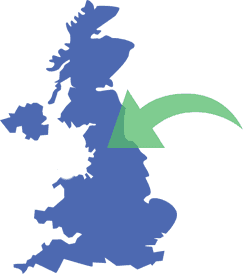 We only use the best couriers, we enable you to track your shipment from door to door, we notify you of delays pro-actively and we serve you through a UK-based call centre, with logistics experts on hand. You don't need an account to use , in fact you don't even need to register with us, but if you do, you'll be eligible to save up to a further 8% on your shipments. International courier services to over 220 countries. No need to register, but if you do, save up to 8% more. Track your parcel from door to door. offers door to door same day, next day delivery and timed delivery services at highly discounted prices. Additionally, our ‘Access Point' service, offers you the option to drop off and/or collection your package from over 20,000 retailers nationwide. We can collect same day and deliver next day across almost the entire United Kingdom, with late collection in London and many urban areas. Whether you need us to collect from the UK, or deliver to the UK from abroad, offers worldwide parcel services from over 220 countries worldwide. We also offer a comprehensive range of express and economy international shipping options to suit every budget. So whatever your sending abroad, makes sending parcels abroad easy and hassle free and we're even cheaper than sending by post! are specialists in large parcel delivery. Whether you're sending an oversize package, a heavy parcel or a pallet, has a range of services to suit your needs. What's more we can ship large parcels on both express delivery and economy freight services to suit every budget. Bookings for large and heavy parcels do however need to made 24 hours in advance . serves thousands of businesses across the UK. Our specialist business courier service offers savings of up to 8% on our published prices, dedicated account management and full credit facilities. So whether you're an eBay seller, an SME or a large corporation, 's professional business courier service can save you money, transform your logistics and help deliver your promises to your customers.